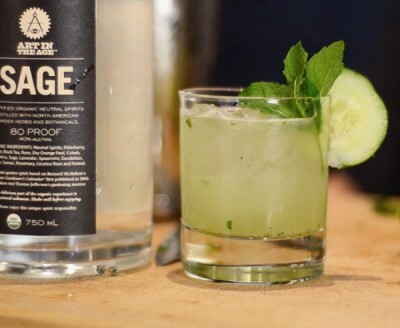 If you’re stuck in a cocktail rut consider swapping out your standby gin for the new Sage Cordial from Art in the Age. Check out the video above to hear wine and spirits consultant Laura Mooney talk about what makes the production of Art in the Age unique and see her recipe for a fresh garden cocktail. Add sliced cucumber, 1 sprig of mint (finely chopped) and St. Germain to shaker. Muddle. Add Sage Cordial and freshly squeezed juice from half of the lime and ice. Shake vigorously for about 30 seconds. Strain into rocks glass filled with ice (one large ice cube also makes a great presentation). Garnish with a slice of cucumber and sprig of mint. Sip outside on a nice day.